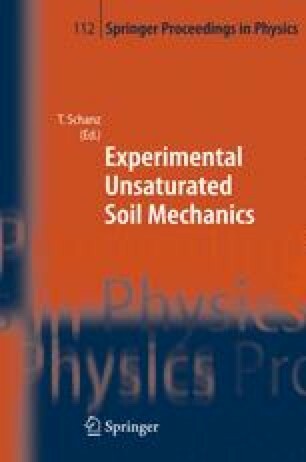 In this paper a new experimental device for unsaturated soil testing is presented. The new Double Wall Biaxial Cell was designed to study the behavior of unsaturated granular material under plane strain conditions. The required calibration of the new device is presented in detail. Saturated soil samples were tested in the new device under isotropic consolidation conditions. The volume changes of the specimen were measured by two alternative methods to check the reliability of the new device. To verify the independent two stress state variables concept proposed by Fredlund and Morgenstern, Null-tests were performed on sand-kaolin mixture specimen. Axis translation technique was used for creating the desired matric suction. The details of the new device and the test procedures are described. The obtained result are presented and discussed in detail.